6-7am: Hotel pickup. Pickup locations and departure times will vary based on how many attendees are on the trip. 8am: First stop at the Hoover Dam. You’ll have about 15 minutes to enjoy the views of the Hoover Dam and take photos. 12pm: A light lunch will be provided about an hour before we reach our tour destination. 1pm: We arrive at the Grand Canyon and spend about 3 Hours at the National Park visitor center, Mather Point, and Bright Angel Lodge. 4pm: We start our return trip. 9pm: We’ll take the Mike O’Callaghan-Pat Tillman Memorial Bridge as we approach Las Vegas. Enjoy the breathtaking views of the Hoover Dam and the Las Vegas skyline. Here is your chance to experience the beauty and the majesty of the Grand Canyon first hand. 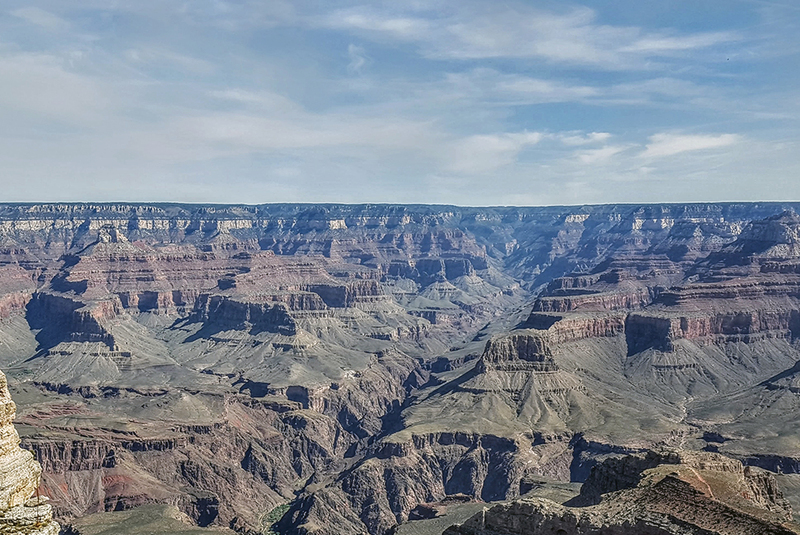 One of America's most famous National Parks, this tour takes you from Las Vegas on board our luxury busses all the way to the Grand Canyon South Rim National Park and back in just one day. One of the seven wonders of the natural world, the Grand Canyon is a sight everyone must see. Enjoy this one-day tour from Las Vegas on board our top of the line half-million dollar luxury motor coaches. Equipped with comfortable reclining seats and foot rests for your comfort you can sit back and relax. Enjoy unobstructed views from anywhere on the bus through our giant vista view windows. An on-board restroom is included for your convenience and we make several comfort stops for photos and to stretch your legs along the way. Please check the itinerary tab for full details on the tour. Your day starts with a complimentary pickup at your Las Vegas Strip or Downtown Las Vegas Hotel. We don't waste your time by bringing you to a tour center. We'll pick you up on the actual bus and begin your journey to the Grand Canyon. A light snack is provided in the morning as we make our way out of Las Vegas on to the Hoover Dam, one of the most amazing construction projects ever completed (actually on time and under budget) be amazed at this modern engineering marvel as we make a photo stop so you can capture some unbelievable pictures of the mighty Hoover Dam. Our tour continues on to the Grand Canyon—just a few hours away from Las Vegas. Your professional driver guide will narrate along the way so you are sure to not miss a thing. As we travel along Historic Route 66 your driver guide shares historical facts and insights as we comfortably continue to the Grand Canyon National Park. All park entry fees are included on this tour so no need to break out the wallet for extras unless you want to grab some Grand Canyon souvenirs. Our tour spends the most amount of time at the Grand Canyon of any bus tour from Las Vegas, more than 3 hours in total with stops at the most popular sightseeing stops to give you the best possible views of the amazing Grand Canyon. We'll stop at the Grand Canyon National Park Visitors Center, Mather Point and the Bright Angel Lodge with plenty of time for sightseeing, photo opportunities and souvenir shopping. Be sure to charge up your cameras you won't want to miss a thing. On our return to Las Vegas, sit back and relax. We like to play modern movies on the on board televisions to help the return trip go faster. Your day concludes with a drop off right at your Las Vegas hotel, back to your comfortable bed and memories to last a lifetime. Make your reservation today for this amazing tour as we do sell out regularly and space is limited.